Every day this week, BBC Radio 4 is broadcasting a 45-minute programme at 9.00 am bearing the title ‘The New World’. This is a series of programmes examining the major forces that are changing the world around us. The first programme focused on ‘post-truth’ and bore the title ‘Nothing but the Truth’. For me this is just the right programme, after all that happened in 2016, including ‘fake news’ allegations surrounding Brexit here in the UK and Trump’s election in the USA, to broadcast at the start of 2017. It pulled together and tried to explain society’s changing relationship with truth. It tried to unpick what we mean by ‘post-truth’ and what it means to live in a ‘post-fact’ world. The programme drew on several research studies and spoke to a number of different scientists, researchers and others. The podcast gives further details of these speakers and can be accessed on the BBC website at Nothing but the Truth although I realise that this won’t necessarily be available to those living outside the UK. The programme started by telling us that ‘Post-truth’ was the ‘word of the year’ in 2016, when it was added to the Oxford Dictionary. It suggested that 2016 was the year in which people questioned whether facts matter any more and whether there is any longer a need or role for experts in our society. Post-truth describes the world according liberals and their liberal angst. (See The Fallacy of Post-Truth by Rune Møller Stahl & Bue Rübner Hansen for more on this). When did we enter this post-fact world? According to Rune Møller Stahl & Bue Rübner Hansen any one of a number of events could have been the cause, but the Radio 4 programme presenter suggested that the first clear instance of there being a lot of information ‘out there’ with no basis in fact was the claim that Saddam Hussein possessed weapons of mass destruction. Events went on to show that when facts are coloured by ideology it is difficult to change people’s minds. In this case people not only resisted the evidence that there were no weapons of mass destruction but also became more convinced that there were – a phenomenon known as the ‘backfire effect’. By developing counter arguments people become more entrenched; they persuade themselves and they rationalize instincts and feelings that they already have after the fact in an act of retrospective justification. They put their feelings first and make the facts fit. They think they are reasoning but are actually rationalizing. The programme posited that we all have this pre-disposition, i.e. the pre-disposition to selectively accept information which is consistent with our world view and the more proficient we are at analysing data the more we do this; we interrogate the evidence and ‘waterboard’ it until it tells us what we want to hear. Fact and truth. The programme went on to discuss that there are different kinds of facts. When is a fact not a fact? Take for example the question, ‘Is the UK in the EU?’ This is a straightforward question to answer. It is a fact and a truth that we are currently in the EU. 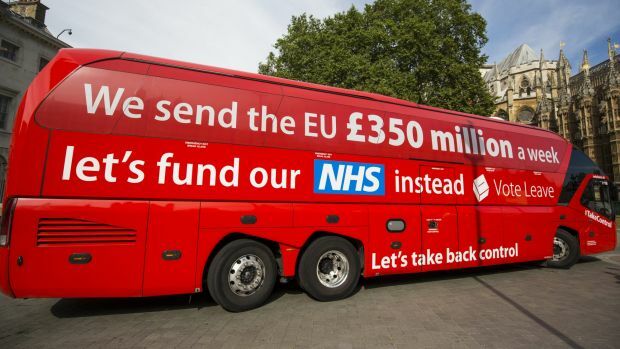 But the question ‘how much does the EU cost the UK?’ may have many answers (many truths and facts) and the question ‘is it good for us to be in the EU?’ is not a question about facts but about values. Fact and truth are not the same thing. Has our relationship with truth changed over time? Truth is more personal and is about how you feel about the world. We are all more or less biased. Areas of life that are not about facts but about values shouldn’t be the monopoly of politicians, intellectuals and self-appointed authorities. No-one knows what it’s like to live your life. We don’t have to trust others to interpret the truth or its relevance for our lives. Echo chambers. If our relationship with truth has changed over time, why is this so? The Internet has affected us all and changed society. Two-thirds of Americans now get their news from social media and this is an increasing trend in the UK. But we tend to inhabit echo chambers on the Internet. We live in filter bubbles seeing echoes of our own opinions, amplified by social software’s algorithms (e.g. Facebook) which give us more of the same and ensure that we don’t encounter dissenting information. And this doesn’t only happen on the Internet. Some research from America and in the UK has shown that like-minded people move to live near each other. This is known in America as ‘the big sort’ and studies of psychological geography have linked geographical clustering to personality differences, making the chances of meeting people different from us increasingly slim. How can we burst the bubbles we live in? How do we get contrary information and alternative perspectives into echo chambers? It seems that we can’t win arguments by throwing in more facts. It’s not an information deficit that we suffer from, but an affinity deficit and a lack of trust. We determine the truth by the people and sources we trust. It’s not that facts don’t matter any more. What is really worrying is the lack of trust underneath this which comes from being exposed to fewer opposing views and which makes it harder to believe the other side has anything to offer. What was suggested in the programme is that it’s difficult to build trust, but perhaps we could start by trusting ourselves a little less, asking ‘Can I trust how I feel?’ We should be anxious about echo chambers and fitting what we see to maintaining our standing in the group. We should resist forwarding to our echo chamber that article that proves how right we are. Just because we like it doesn’t mean it’s true. We should listen more to people we disagree with and make a habit of doubting what we hear, see and read if only for a short time each day. Like others (see for example Audrey Watter’s post – Education Technology and the Year of Wishful Thinking) during 2016 I became increasingly aware of the issues raise by this Radio 4 programme, of the echo chambers in which I work and live and the pressure to conform to group ideologies. Alternative perspectives are often not welcomed and as I have personally experienced can be met with at best silence and at worst abuse and ridicule. As an academic and researcher this seems a particularly sorry state of affairs. And of course technology – big data and algorithms – have a part to play as you and I know from work we have done together and separately. Thanks for this Jenny, will get back here asap. BBC 4 program downloaded perfectly. Jenny, my sense of developing identity requires a recognition of at least the possibility of ‘others’ who seem to function under a different set of worldly understandings. Agree that the point is not to control or actively intrude to ‘correct’ these understandings, only to appreciate the uniqueness we MUST accept in others to claim autonomy for ourselves. To me, conservatism as currently practiced is about the will of authoritarianism to dominate and redefine the individual as a mindless follower. People are not unique but merely alone and helpless. Unable to make our mark on the world we must accept the protection of tyrants. By braking social contracts, there are no intermediaries that can allow for us to be individuals AND work together. Not complete on these thoughts beyond the observation that Trump types operate on the notion that the world emerges from their assertions and they WILL NOT have this questioned. Thanks for sharing your thoughts Scott. Like you, and I suspect many others, I am still trying to make sense of what happened in 2016. This set of programmes on Radio 4 has been very helpful in understanding how the shifting balance of global power, the rise of populism and changing population demographics will all influence how we live our lives in the future. There seems to be a giving up on understanding each other across cultures so we go back to myths of “our people” before contact with others. On this side of the Atlantic whiteness is taking on the role of founding peoples which not only requires a need to show allegiance to sameness when sameness is something we don’t see but the creation of a non-functional model of society. Maybe we are losing the ability to appreciate and navigate variety? Populism is constantly seeking proof of disadvantage in a mix that can only be solved by someone or some belief being dominant.